The first is a yellow-orange shadow agate found in Sedar Bay. David also found this incredibly rare Lake Superior cloud agate. How about David’s copper replacement agates from the Keweenaw! David’s next agate is a rare dendritic, also out of Sedar Bay. He explained in his email that this Laker has inclusions of hematite, goethite, and limonite in a chalcedony gray agate fill with some minor Adularia. The last agate photo submitted by David is one that he calls the clown agate. Brandon Haddock visits Grand Marais several times a year, including in the winter when he and his friend goes winter camping. Here are a couple of photos of nice agates that Brandon found last year in the Grand Marais area. Tony from the Granite Falls, MN area found this nine ounce agate and sliced the end off. 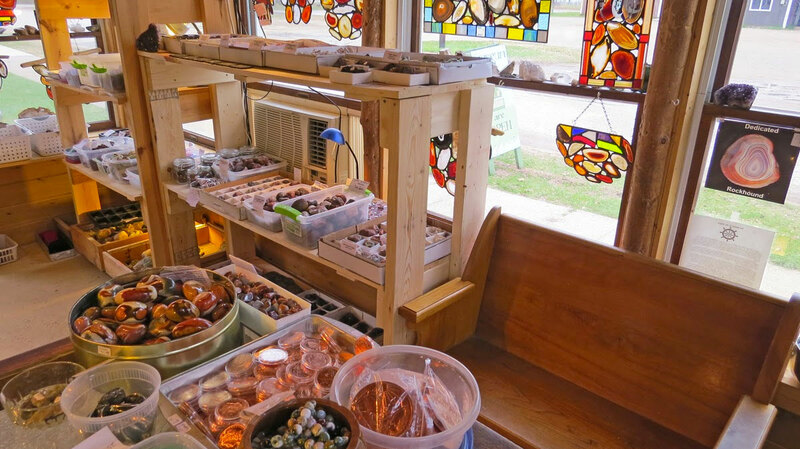 Last September a family visited my booth to show off some fantastic agates. Too much time has passed and I no longer can locate the card on which I recorded the name. If you see this and would like your name included, please email me at Karen@agatelady.com. The other day Mark Buda from Bay City, MI visited the museum again. When he was here last year, he told me about acquiring a number of agates from an estate sale, including two large Lake Superior agates. He had the scuffed up one face polished. The first face polished specimen is four pounds. It includes some fortification sections as well as several tubes. The other specimen is a five pound fortification agate.